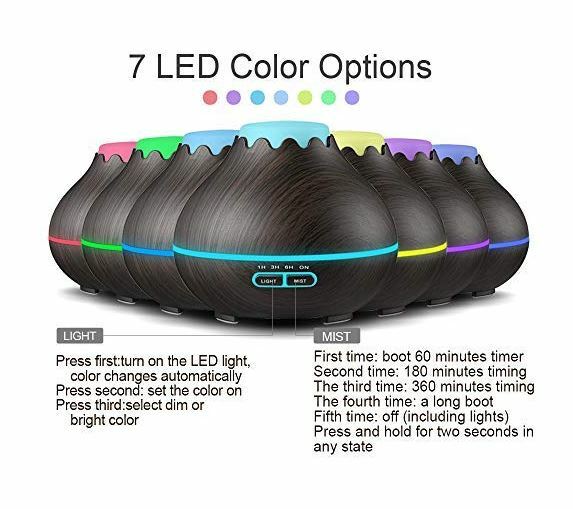 For a limited time you can get this Essential Oil Diffuser With 7 Color LED Light on sale for $16.49 with the code: P7PIHL5B at checkout. -Super Quiet and Auto Shut Off: With ultrasonic technology, this diffuser is extremely quiet when working. Automatic shut off when water running out, ensure the safety. -Ultrasonic technology: Featuring ultrasonic to mist, soft and quiet, which provides effective relief for dry skin. -Large capacity: Aroma Diffuser can hold up to 400ml of water and run continuously for 15 hours, A long press to switch between high and low mist to extend the duration of misting. -Wood Grain Appearance: The elegant and distinctive wood design brings the breath of nature with tranquility which is the best choice for your living and working place.